Mommy Moments: Body Massage, Please! 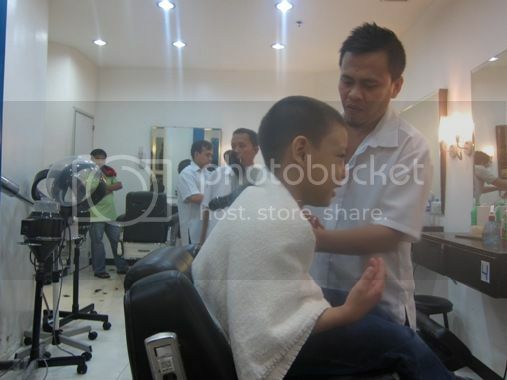 We went to my husband and son’s favorite barber, Kuya Zaldy, at Robinsons Galleria last Saturday, November 5, 2011. After weeks of coaxing, I was able to convince my husband to have my son’s old hairstyle back. My husband prefers a longer hairstyle for my son, but I like my son’s short haircut below, which gives him that cool and clean look. After his hair was done, my son requested for a massage, which comes for free. Using an electric massager, Kuya Zaldy massaged Justin’s back, arms and legs. We were supposed to look for back-to-school backpacks for kids after his barber appointment, but because my son liked how he looked and enjoyed the free body massage, he totally forgot about it. Oh, well, there’s plenty of time for that. This entry was posted in Body Massage, Haircut, Mommy Moments. Bookmark the permalink. 7 Responses to Mommy Moments: Body Massage, Please! ako din I prefer short hair for my kids .bagay kasi sa aknila di ba? 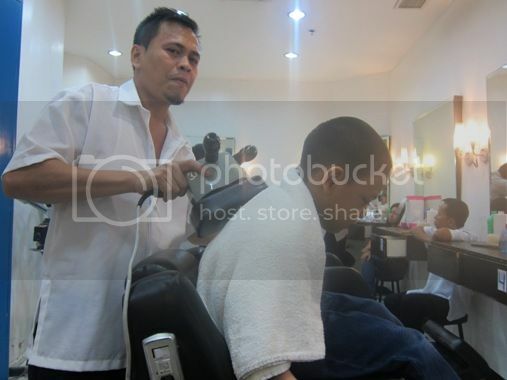 your son looks happy at the new hair cut at feel nya talaga magpabody massage ,hahaha. he looks so big na Tetcha! 🙂 the haircut looks good on him. Mommy Tetcha, kala ko ikaw ang nagkaroon ng free massage, magtatanong pa naman ako sa iyo kung san yan, hahaha!!! My son is 4 and he still sits on my lap when we go to the barber shop. No matter what I tell him, he doesn’t want to sit on the chair while having his haircut. Did you go through this phase? a barber with free massage? What’s the cost of that haircut? such a gwapito! glad that he’s enjoying so much!